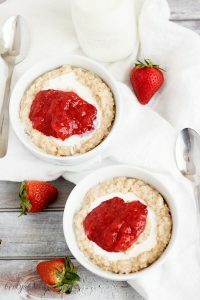 Our strawberries and cream steel cut oatmeal recipe is a simple, yet delicious combination of steel cut oats and sweet strawberry jam. 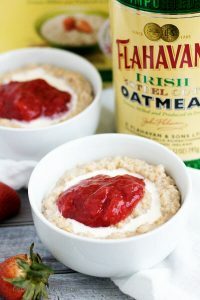 For today’s recipe, we partnered up with Flahavan’s Irish Oatmeal to create an easy and healthy breakfast dish that is perfect for those busy workdays. We used their quick-cook steel cut oats to make a hearty oatmeal that fills you up and tastes great. As you know, most steel cut oats take a while to prepare and in some cases have to soak overnight. Most people don’t have that much time on their hands; especially on workdays. For this recipe, all you need is their 5-minute single-serving packages and our Sunday Morning Strawberry Jam. The quick-cooking steel oats retain their unique texture and density. Which is rare when it comes to most other single serving oatmeals on the market. Usually, you end up with a bland, mushy bowl of oatmeal or an overly sugared mushy bowl of oatmeal. All you need is a few of your favorite toppings or spices, and you are good to go for the morning. The jam provides a little sweetness, and the cream adds a touch of fat and silkiness to the offering. Best of all, it only a takes a few minutes to prepare. Kim pointed out that one aspect of using an unflavored oatmeal is the versatility of the product. It’s a blank slate which you can modify and transform into anything you like. For example, if strawberries aren’t your thing, try applesauce, or peaches. Some recipes include savory toppings like bacon, cheese, and green onions. The world is full of flavors, so go crazy! If you are interested in trying Flahavan’s Irish Oatmeal, check out their product locator here. Before we get started on the instructions, let me wish everyone a long life, everlasting love, and a full belly. If you have already made our jam, then fixing this dish will be extremely simple. For the jam recipe, click here or on the recipe card below. For the oatmeal, all you need to do is follow the directions on the package. The product wrapping explains you will need 1 packet of quick to cook 5-minute steel cut oats and 1 cup of water. Now, we usually add 1/4 teaspoon of salt to our oatmeal, but this is optional so it’s not listed in the directions. hen, reduce the oatmeal to low and let it simmer for 5 to 7 minutes depending on how thick you like your oats. Afterward, let it set for 1 minute, then split the oatmeal between 2 bowls and top with strawberry jam and heavy cream. That’s it, serve and enjoy. Strawberries, not your thing, then take a look at our Cinnamon Roll Oatmeal or Blueberry Oatmeal. 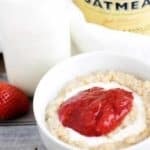 If you like this strawberries and cream oatmeal recipe, please leave us a comment and rate the recipe card. You can also find us on Facebook, Pinterest, Twitter and Instagram searching for Berly’s Kitchen! In a medium saucepan, combine the steel cut oats and water. Bring mixture to boil over high heat, then reduce heat and let simmer for 5 to 7 minutes. Once oatmeal has cooked, remove from heat and let it stand for 1 minute, then separate it into 2 bowls. 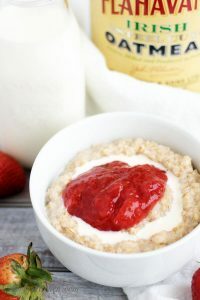 Top each bowl of oatmeal with 1/8 cup of heavy cream and 2 tablespoons of our Sunday Morning Strawberry Jam. Click the link for our Sunday Morning Strawberry Jam recipe. Oh!! What a way to start the day. I’ve never tried this brand of oats but will now have to look for it. Now I’m off to get your strawberry jam recipe. Thanks! Thank you, Sam! We really enjoyed them and once we run out will be buying more. I hope you enjoy the jam recipe as well, thanks again for commenting! We are big on oatmeal in our house. We eat oatmeal everyday! Some days though eating it the same way kind of gets old…so we love experimenting with different recipes. This looks delicious! You bet we’d be trying it out soon (and yes, we put a little bit of salt on our oatmeal too!). Ohhh I love strawberries and cream flavored anything! I bet this is delicious. I love steel cut oats! I usually throw frozen blueberries into mine. I am going to have to try this, though. It sounds delicious! This looks so good! I am going to have to try it this weekend! Oatmeal is normally my go-to breakfast, this is a great way to jazz it up! The waiting is the hardest part! Very cool that these are quick cooking oats – I’ll be on the lookout for them. Love the combo of strawberries & cream, too! Nice! 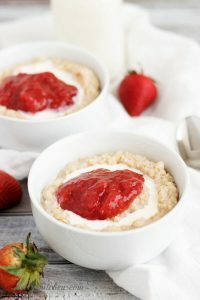 Love steel cut oatmeal and with strawberries, in season this is a super yummy option for breakfast! I eat oatmeal almost every morning. This looks like a great recipe! Can’t wait to try it! Fortunately I have all the ingredients and I am heading straight to my kitchen right now to try this recipe. Oooh! This looks yummy! So simple but so good! This oatmeal variation looks so delicious! With strawberry season right around the corner, you could even puree some fresh berries with a couple teaspoons of honey, instead of using jam. Either way, I’m so looking forward to having this for breakfast soon! First of all, your photos are absolutely GORGEOUS! And this looks so delicious, too! Yummy. I have the oatmeal but no strawberry jam:( Oddly enough I’ve put just about everything on my oatmeal over the years but never thought about jam. And I do love my strawberries. Thanks for the idea. I’m going strawberry picking this weekend! I was planning on making jam anyhow, so adding in some steel cut oats for breakfast next week is a great idea!